The created user will require Administrative privileges. Also, depending on TMOS version and method of authorization the local admin account may be required. To help determine what’s right for your device, please consult the table below. Once you have identified the Version, Authentication, Authorization and User Type based on the chart above, please see the below examples of how to setup the User Account to be used for the Device Credentials when adding devices. Log in to the F5 web interface. Navigate to System → Users → User List. 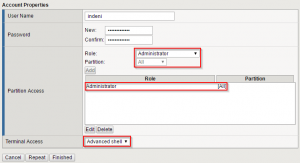 Enter a User Name and a Password, configure role Administrator across All partitions and grant terminal access Advanced shell. Click on the local admin account. Change the Terminal Access from Disabled to Advanced shell. 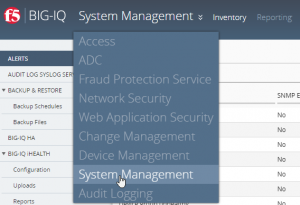 Log in to the BIG-IQ web interface. 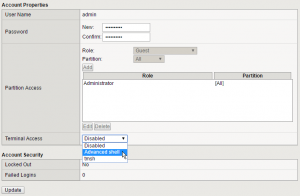 Fill in the details and make sure that the user has the role Administrator. 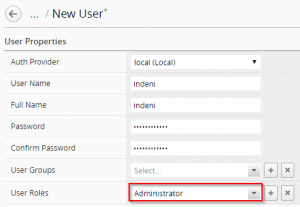 Why does Indeni need Administrator Access and Advanced Shell? Certain versions of F5 require that any user accessing the REST interface must have a role of administrator. The Indeni user needs to access bash to perform all smart monitoring checks. Why does Indeni have to use the Local Administrator Account? When remote authorization is used there is no way of setting the Shell of remote users to Advanced Shell. More information on this can be found here. In version 11.5.4 the only user that has access to the REST interface is the local admin account. This is when a remote service (e.g. RADIUS, LDAP) defines the role a user has after they have successfully logged in to the device. How does Indeni communicate with the BigIP? Indeni uses SSH (Advanced shell), and the iControl REST-API to pull data from the device. What does Indeni do to ensure that it is not negatively impacting the performance of the device? If there is more than one way to script for an issue we will compare, and choose the one that uses less resources. We do not run scripts more often than needed. Each script interval is chosen to ensure that you get the Indeni Rules you need, when you need them. When gathering data we try to minimize the size of the payloads from the device in order to make sure that minimal bandwidth is used. These factors combined ensures that the device resources (CPU, Memory, and Bandwidth) used by Indeni are minimally impacted. If you have additional questions, please feel free to hop on over to our community site and join the discussion!